Experience Required: First Aid Certified, CPR Certified, plus prior experience at least in one of the following professional roles: EMT, CNA, firefighting, corpsman or combat medic, paramedic, nurse, medical doctor or other health profession. These requirements may be waived for nursing & pre-med college students upon interview. 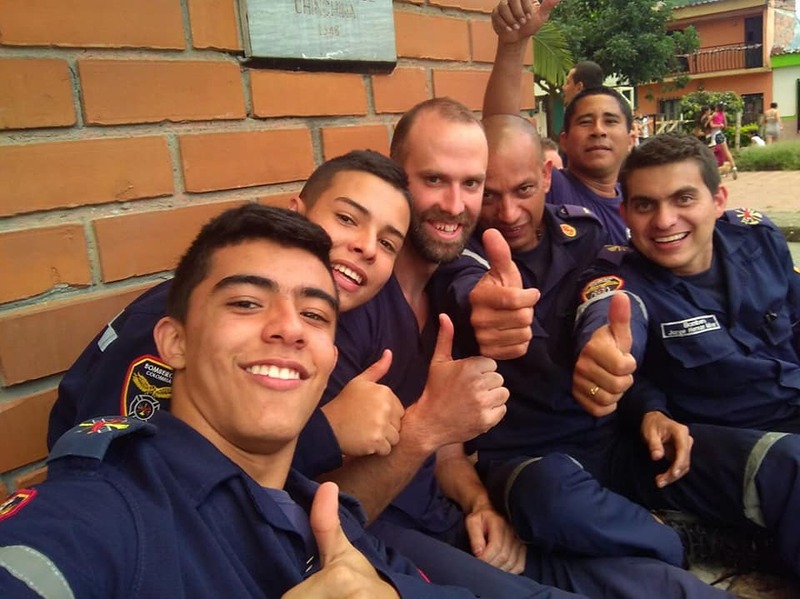 Opportunity to train and share with Colombian first responders in the fields of medicine, and firefighting will offer an unforgettable and valuable experience for anyone interested in health professions. "I had the opportunity to volunteer with Chinchina Paramedics. As an aspiring physician I love a challenge and I love to learn new things. Boy was I not disappointed. Talk about an adrenaline rush when you hear the sirens and you have to go attend a medical emergency. It was a complete thrill. I highly recommend participating with the first responders. They are fantastic & great teachers and lots of fun!" Spanish B.A., next stop is Medical School! "I recently had the opportunity to travel down to Colombia to observe ad ride along in the ambulance which was AMAZING! I feel like I learned a lot and got the opportunity to see the behind the scenes of medicine that I really wouldn't have had the opportunity to see at home. I also got to participate in Search and Rescue training. I would recommend that you do night shifts so you could see what it's like to wake up at 3.a.m..for a medical emergency. This experience is going to be very useful when I go to medical school. I am very grateful for this experience!" Professional Trainer, Health Education, M.A. "I am from England, where I work as a personal trainer and health specialist. So my experience in the fire station gave me a good view of the healthcare system in Colombia. The firemen and paramedics in Chinchina are very professional. Committed and organised, they provide the adequate attention to each patient. I learnt a lot, as the team are always happy to share their explain the how and why of each decision taken. Not only I got to watch interventions, but also I got to try out one of their practice exercises! For sure I recommend the experience." Program Cost: $20/day (USD) - Housing included at Minga House! There is no refund for the first 30 days of programming. Why? Because much unrecoverable staff time & effort is invested prior to your arrival to plan your programming. Step 1: First, verify availability for your chosen primary volunteer or internship role during your estimated desired travel dates. ​Submit your resume (CV) and request a WhatsApp interview by the Volunteer Advisor to evaluate your Spanish conversational skills. Your complete profile will be then presented to your chosen worksite for pre-approval. Read the "additional expenses" section below before committing to volunteer with Minga House Foundation. Step 2: Then, Book your flight, then provide us a copy of your flight e-confirmation so we know 100% that you are coming. ​As mandated by law, a background check is conducted of all program participants. Step 3: Lastly, launch your program by reserving your spot! Your program in full is activated by paying $20/day via PayPal. Payment is required before our sets your program in motion. Housing: $0/day - because it is already included at no additional cost at Minga House in a shared room with bunk beds..
Food: $5-15/day regardless if you eat out daily or prepare your own food in our shared kitchen, depending on your diet. Airport Pick-up & Drop-Off: $40-42 paid directly to the taxi. (we connect you to approved drivers) 45 min ride to Chinchina. Worksite Transportation: $0-5/day round trip via either taxi or public bus; but most sites are within walking distance. Accidental Insurance: $4-12/mo paid by Minga House Foundation; cost veries based on volunteer/internship roles (Required). Medical Insurance: Not required, but highly recommended while traveling abroad. MHF is not responsible for your care.